Presented at the Society for Neuroscience meetings in Washington, D.C. by Felix Vazquez-Chona, William Drew Ferrell, Ed Levine, Bryan William Jones and Robert E. Marc. Full size poster can be seen here. This study is part of a program designed to explore neuroprotection strategies with activated glia. The authors visualized and quantified metabolic relationships between retinal Müller glia and stressed photoreceptors using Computational Molecular Phenotyping (CMP) and large-scale electron microscopy. Unlike traditional spectrographic or chromatographic techniques, the use of CMP allowed visualization of the metabolic response of thousands of individual Müller glia and photoreceptors while preserving anatomical context. 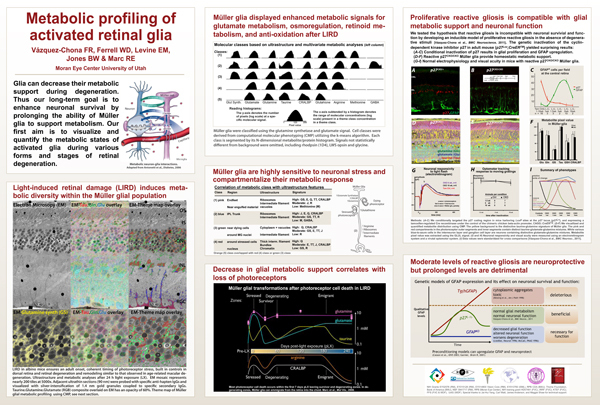 Glial processes surrounding stressed photoreceptors displayed enhanced metabolic signals for glutamate metabolism, osmoregulation, anti-oxidative pathways and retinoid metabolism. Surprisingly, the authors found that inducible GFAP upregulation, proliferation and migration in Müller glia are compatible with glial metabolic support and neuronal function [Vazquez et al., BMC Neuros 2011], suggesting that metabolic responses of activated Müller glia assist metabolically stressed or challenged photoreceptors during the early stages of degeneration. Moreover, moderate and transient levels of proliferative reactive gliosis are compatible with glial metabolism and neuronal function.